When improving your form, it never hurts to have the best tools to help in reaching for your performance goals. My favorite tools as I work on my kicking are my waterproof iPod and headphones from Underwater Audio. It is so great to play my favorite tunes while I swim laps. I even downloaded swimming tips from Olympic athletes to listen to while I swim! I recommend the Swimbuds Sport headphones with your iPod or waterproof player for superior sound quality in and out of the water. With the variety of tips included you’ll be sure to find that perfect fit and watertight seal. Clip your iPod to your suit or cap and get kicking! Why do you even need swimming tips for your kick? You’ve heard that your arms do all the work when you swim. That’s why swimmers get such toned shoulders and biceps. Just look at the size of Michael Phelps’ upper body versus his lower body! 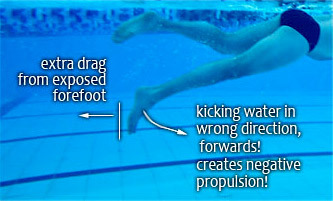 That’s why these swimming tips for a great kick are so important! If you’re a runner, you may struggle with this. Running is safer with less flexible ankles, since you are continually pushing off the ground. You don’t point your feet or stand on your toes. Swimming is the opposite. If could look closely at an Olympic swimmer’s toes while she kicked, you would probably notice that they are bent past straight. This creates the least possible drag, keeping them in line with your body and creating a smooth surface for water to rush by instead of catching it (which happens with inflexible ankles). The single most important thing about kicking in the water is…. We already know that flexing your ankles causes drag. Think how much bigger your legs are than your feet. Bending your knees is essentially the same thing, causing your legs to have a much larger surface area. You want to allow for some natural bend in your knee as you kick. But keep your legs as straight as possible and use your hips and core to generate motion. Aside from creating less drag, your legs get tired faster than your core, so you are being more efficient and conserving energy! The more you point your toes, the less drag there is with each kick. And if you’re kicking 3 times per stroke, that adds up fast. Think of your ankles as oars in a boat. If you turn them flat against the direction of the water, you slow down. If you turn them so the thin side is hitting the water, you have no drag. You always want to choose the “no drag” option! But it gets worse. Not pointing your toes can actually make you go backwards! Think about it, if your feet are flexed, then every time you kick you’re actually pushing water towards your body, which is the WRONG WAY! Ankle flexibility will help with this. 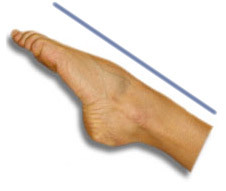 Just like anything, the easier it is to point your toes, the more likely you are to do it. Keep your legs straight. Ankles straight. Feet pointed. It all sounds so rigid…..are you afraid of cramping up and not being able to focus on anything else? You don’t want to be tense when you’re swimming. Ideally, you should relax your muscles while maintaining good control over your body. Keep everything in line, but not so tightly that you lose flexibility or your natural motion. This ties in nicely with kick timing. You also need to keep control over how often you kick. Use the 2 beat kick if you want to save energy in your legs. Kick once for every time your arm enters the water. Use the 4 beat kick if you think that 2 is a little slow, but you aren’t trying to book it. Kick twice per stroke. Use the 6 beat kick if you care about speed. Kick 3 times for every stroke. 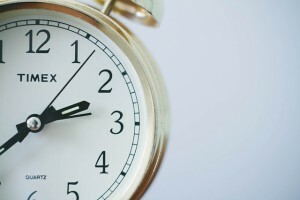 This is the standard timing used in competitions and races. Even though you’re only kicking 3 times per stroke, the speed and effect that you can achieve varies greatly depending on how hard you kick. More isn’t always faster. Harder is faster, too. After you absorb these 4 swimming tips, keep working! There are lots and lots of drills you can to do self-evaluate your kick right now and then try to improve it. ...and generate the power from your hips and quads. 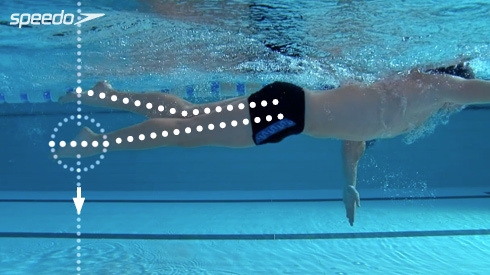 To work on pointed toes, try swimming with fins and feel the difference. 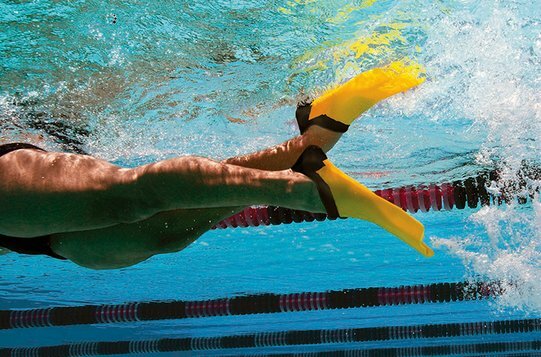 Flex your ankles and see how much drag you generate with fins on. It will be impossible not to notice. Now point your toes and see how much propulsion you get that way! You’ll be amazed. Improving ankle flexibility will take a little longer but isn’t hard. Try sitting back on your feet for a few minutes each day. Once it gets easier to sit like that, try staying in that pose longer. After a few months you’ll be able to bend them like a pro! What’s your favorite drill for improving your kick? And which one of these do you need to work on most? Tell us in the comments section!